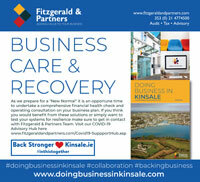 Fitzgerald & Partners Kinsale Client Payroll Services have an experienced payroll team and provide a cost effective comprehensive payroll management service catering for small family businesses to large companies. Knowing your staff will be paid on time every time will give you peace of mind and create a better working environment for all. PAYE Modernisation For Employers- Are you ready ? Revenue have made significant changes to the PAYE system from January 1st 2019. The new system will mean that they receive payroll information in real time. Effectively, this means that an electronics return must be submitted to Revenue as part of each and every pay run. Revenue are making this change to try and ensure that, at all times, they have the most up to date information on an employee’s tax status so that correct credits and cut offs can be issued. The electronic return, which will be prepared automatically by our payroll software, must be submitted “on or before” the payroll date. This will impose a greater obligation on employers to ensure that the information submitted in every payroll run is as correct and complete as possible. Corrections can be facilitated under the new system, but they may have adverse consequences. For example, they might give rise to interest or penalties in the event that they result in additional PAYE being due. In the past corrections could be handled by adjusting the annual P35 but from 2019 this will not be possible. Chat to Linda Farley on 021 4774500 to outsource your payroll to Fitzgerald & Partners or for training on help to prepare for PAYE Modernisation and she will assist in your query..